Hand built in the USA since 1977, Mike and his expert team custom build around 250 instruments of the highest quality per year. There is currently a 5 month waiting list for a custom order. 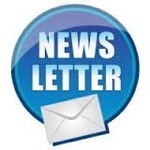 Instruments in stock at Bass Direct - please click on images for more information. IT´s the best sound between 60 and 70 jb I´ve ever heard and had. It`s so lightweight. I love it. It was good to put a face to the name / voice when I came to Warwick a few weeks ago. The PJ4 is really a superb bass, the finish is exceptional and the range of sounds using the pan control is unbelievable. What really impresses me is how comfortable it is to play, contoured like a Stratocaster and so light. From my perspective a really good buy. Congratulations on the new Bass Direct bass made especially for you. In the picture you were wearing a cool Bass Direct polo shirt. Do you actually sell these? 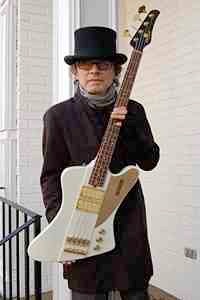 Mike Lull introduced a new Tom Petersson signature bass, the TPT4, at NAMM this year. The TPT4 is based on Lull’s T4, with some tweaking specified by the Cheap Trick bassist. One of the key differences is the pickup placement. The pickups, made by Lull, are both pushed up closer to the neck: a position that Petersson worked meticulously at to find and achieve his signature sound. Also unique to the TPT4 is a gloss-white finish with gold knobs, pickguard and hardware. Pricing is subject options that you choose. 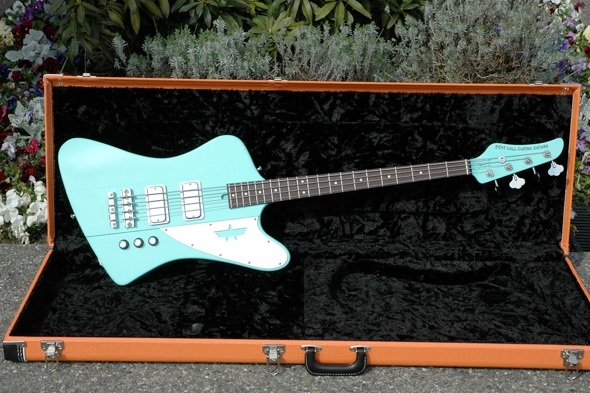 Long time Northwest guitar and bass builder, Mike Lull, has collaborated with Pearl Jam’s Jeff Ament to create the “JAXT4” signature Jeff Ament electric bass. This handmade instrument will be available starting in January and marks the first time any member of the 20-year-old iconic musical group has put their name on an instrument. 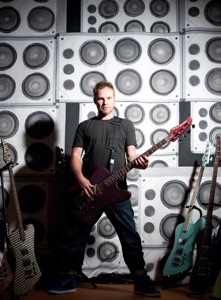 “The only bass that plays like a modern handmade machine and sounds like the best vintage Fender or Gibson in the shop,” said Jeff Ament. “I’m honoured to put my name next to Mike’s on this beast. 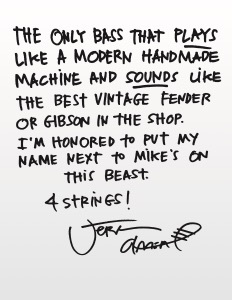 4 strings!” (Ament’s quote in his own handwriting is included as an attachment). The JAXT4 will be unveiled at the National Association of Music Merchants (NAMM) Show the weekend of January 19-22, 2012 in Anaheim, California and be available for purchase thereafter.